Home Page | Uncategorized | Does the type of capacitor used effect your guitars tone? Does the type of capacitor used effect your guitars tone? Different capacitor types do actually yield different tones. Now, this is a subject that I see a lot of debate and argument over. There are believers and non-believers so we’re going to discuss the types without getting too into the tones they provide. The most common cap found in production line guitars is ceramic. These are small disc-shaped capacitors that are extremely cost effective and considered by most tone connoisseurs to need immediate replacement. There is nothing wrong with these capacitors, they do the job they were intended to do which is shunt high frequencies to ground. From what I’ve experienced with these cap’s is they have a bit of a grainy aspect to the highs and really have no definitive character when rolled down, they just sound kind of flat to me. Ceramic disc caps are super cheap (usually a couple of cents each) and easy to find. If you’re not too concerned with the minutiae of tone, these work just fine. If you’re picky like me, you may want to try something else. One of the most popular capacitor upgrades I’ve seen and been asked to do for people is to install an “Orange Drop”. These are made by Sprague/Vishay and are pretty easily identified by their orange casing and rectangular shape. The 715Pand 716P series are made from Polypropylene film and foil and have a slightly aggressive top end that I’ve heard described as “harsh” before but I prefer the term aggressive as they lend themselves well to more aggressive styles of music like rockabilly and rock and even country where a dominant top end is desired a lot of the time. I’ve also found these to have a very “clear” sound when used with hotter humbucker pickups. Another popular capacitor for a vintage tone is paper-in-oil caps. These can be found in new manufacture from Angela Instruments (in both aluminum and copper foil), Allparts (Vitamin Q) and Luxe Repros. I love these for Tele’s and Strats. They have just the right amount of treble bleed when bypassed (tone on 10) and roll off highs smoothly with a rich sound. They’re hard to describe but I’ve found them to be the most “vintage” tonally and the most pleasing to me on single coils. Paper-in-oil capacitors tend to be on the expensive side due to not being widely manufactured. There are also lots of vintage paper-in-oil capacitors out there to be had but they command a premium price and are getting harder and harder to come by. Polyester film capacitors are another cap upgrade I’ve used with great results. The most sought after of these being the vintage Mullard “Tropical Fish” capacitors that are getting pretty hard to track down and quite expensive. I’ve used some before and found them to be punchy and big sounding with single coils, fattening up otherwise thin sounding guitars. Some great alternatives to the vintage Mullards are the Orange Drop 225P series. Unlike the 715P and 716P series, the 225P is made from Mylar film and has a very smooth quality to it. I hear it as having a similar “fattening” quality to the Mullards but I also hear a slightly more present top end and wonderfully clear midrange with these. Another one I liked for customers looking to upgrade on the less expensive side are metalized polyester film caps that can be had fairly cheap. While they don’t sound like the Mullards or Orange Drop they do have a “fattening” quality to them with what I’ve found to be an almost “hi-fi” top end and very even mids. 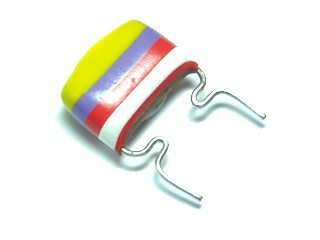 Mallory capacitors are also very popular. These metalized film caps have been compared to the famous “Bumblebee” capacitors found in vintage Gibsons. I personally have not heard the vintage “Bumblebee” caps so I cannot comment on this but I’ve found the Mallory caps to be transparent and gorgeous with a “sweetness” to the sound that I cannot describe. Maybe it’s in the overtones but I just hear something in there that my ears really enjoy. One of the most requested capacitors I had was the Sprague “Black Beauties”. These are very sought after vintage capacitors that have a warm tone Les Paul fans adore. I have never even come across them in my work but I know they can be found if you look hard enough. You will more than likely pay a premium for them but if you do have or find them, please comment below as to how you would describe them, we’d love to hear. Luxe does make a nice replica but I’ve been told they actually don’t sound quite the same. A little quick note on vintage capacitors. As capacitors age, the materials used to make them tend to dry out and become ineffective. Some vintage capacitors were made for military use and have the internals protectively encased in other materials that keep them from drying out. The point is, as with anything you are purchasing online, do your research. Only purchase vintage capacitors from a reputable seller that specializes in them. You might pay more than from the guy on eBay with the colorful auction, but you’ll be guaranteed a quality product that hasn’t dried up and gone past its useful specifications. With all this being stated, experimenting with different values and type’s of capacitors. Is a relatively inexpensive and easy way to customize your guitar tone. A basic rule for tone caps is that the bigger the cap value, the darker the tone. Depending on the cap’s value (capacitance), the effect can reach from “slightly warmer” to a “woman tone” all the way to “completely dark and clinically dead.” Remember, the tone cap is always part of the guitar circuit and it even influences the tone when the tone pot is fully opened.